Southampton duo Jonathan Afolabi and Will Smallbone each scored twice in a comfortable 5-0 win. Southampton's Jonathan Afolabi scored twice for the Ireland U19s in today's win over Romania (file pic). THE REPUBLIC OF Ireland have made a very encouraging start to the elite stage of the qualifiers for this summer’s U19 European Championship. With Southampton duo Jonathan Afolabi and Will Smallbone each scoring a brace, Tom Mohan’s side ran out 5-0 winners over Romania this morning in Krasnodar. It was the first of three games that Ireland will play over the course of seven days in the Russian city. Azerbaijan and Russia are also in the mix, with the winners of the four-team group advancing to the tournament in Armenia in July. Afolabi and Smallbone both scored inside the opening 11 minutes to put Ireland in the driver’s seat. Smallbone helped himself to another with eight minutes played in the second half, and Claudiu Petrila scored an own goal moments later to leave Romania trailing 4-0. 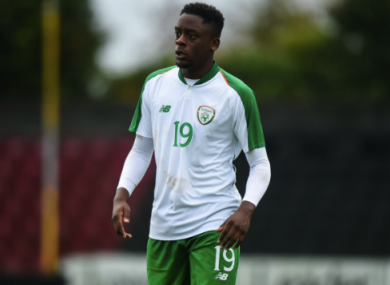 Afolabi grabbed another for Ireland on 64 minutes, before St Patrick’s Athletic’s Brian Maher prevented Romania from scoring a consolation goal by keeping out Genk midfielder Vladimir Screciu’s effort from the penalty spot. Today’s result is particularly impressive in the context of the calibre of Ireland’s absentees. Defender Lee O’Connor (Manchester United), midfielder Conor Coventry (West Ham United) and forward pair Troy Parrott (Tottenham Hotspur) and Adam Idah (Norwich City) are all missing from the travelling party in Russia after being promoted to the U21 squad, although Parrott has been ruled out of the set-up through injury. Goalkeeper Gavin Bazunu and midfielder Brandon Kavanagh are other members of the U21 squad who would also have been eligible to play for the U19s. Brighton & Hove Albion striker Aaron Connolly and Stoke City defender Nathan Collins were unavailable due to injuries. Ireland reached the elite qualifying stage after topping their group in the preliminary qualifiers last October by defeating the Netherlands, Bosnia & Herzegovina and Faroe Islands. Russia and Azerbaijan, the other two teams in Group 1 of the elite qualifying stage, will face each other this afternoon. Ireland will take on Azerbaijan on Saturday (9am Irish time), before rounding off their campaign against the group hosts next Tuesday (2pm Irish time). REPUBLIC OF IRELAND: Brian Maher (St Patrick’s Athletic), Andy Lyons (Bohemians), Kameron Ledwidge (Southampton), Jack James (Luton Town), Oisin McEntee (Newcastle United), Aaron Bolger (Shamrock Rovers, on loan at Cardiff City — captain), Ali Reghba (Bohemians), Jason Knight (Derby County), Jonathan Afolabi (Southampton), Will Smallbone (Southampton), Will Ferry (Southampton). Subs: Richie O’Farrell (UCD) for Reghba (71), Luca Connell (Bolton Wanderers) for Smallbone (71), Tyriek Wright (Aston Villa) for Ferry (80), Mark McGuinness (Arsenal) for James (80), Tom Gaston (Bordeaux) for Lyons (84). ROMANIA: Andrei Cristea (Gaz Metan Medias), Andrei Rus (Gloria Buzau), Sorin Serban (Minaur Baia Mare), Marco Ehmann (SSC Farul Constanta), Radu Chiriac (Astra Giurgiu), Claudiu Petrila (CFR Cluj), Valentin Mihăilă (CS Universitatea Craiova), Vladimir Screciu (KRC Genk), Leonardo Mitruscsak (Sighet), Raoul Baicu (CS Universitatea Craiova), Antonio Manolache (ACS Poli Timisoara — captain). Subs: Alexandru Tirlea (Real Madrid) for Rus (32), Antonio Sefer (Rapid Bucharest) for Manolache (32), Andrei Banyoi (Lipova) for Mitruscsak (58), Rares Ispas (CFR Cluj) for Serban (58), Ovidiu Horsia (Academica Clinceni) for Serban (79). Email “Ireland U19s trounce Romania to take big step towards qualification for the Euros”. Feedback on “Ireland U19s trounce Romania to take big step towards qualification for the Euros”.